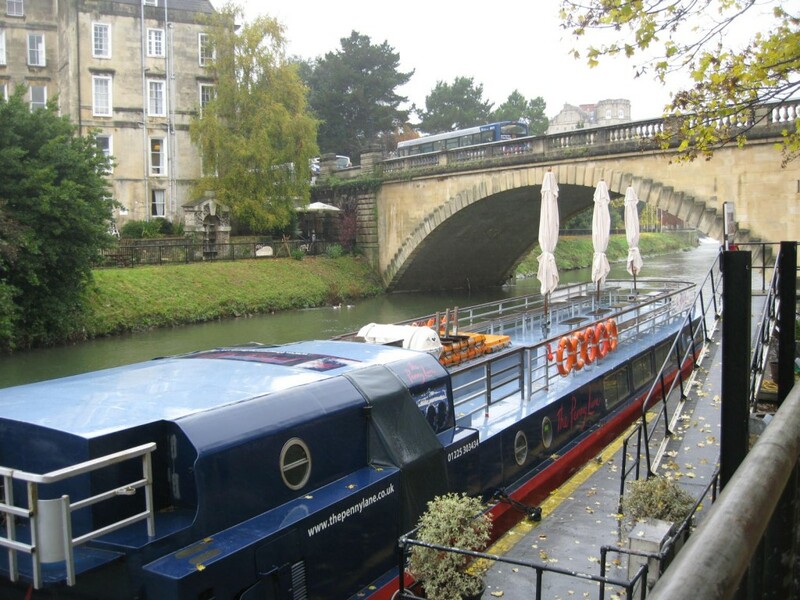 When I took the train from London to Bath, I noticed canals with longboats, also called narrowboats, all along the way. 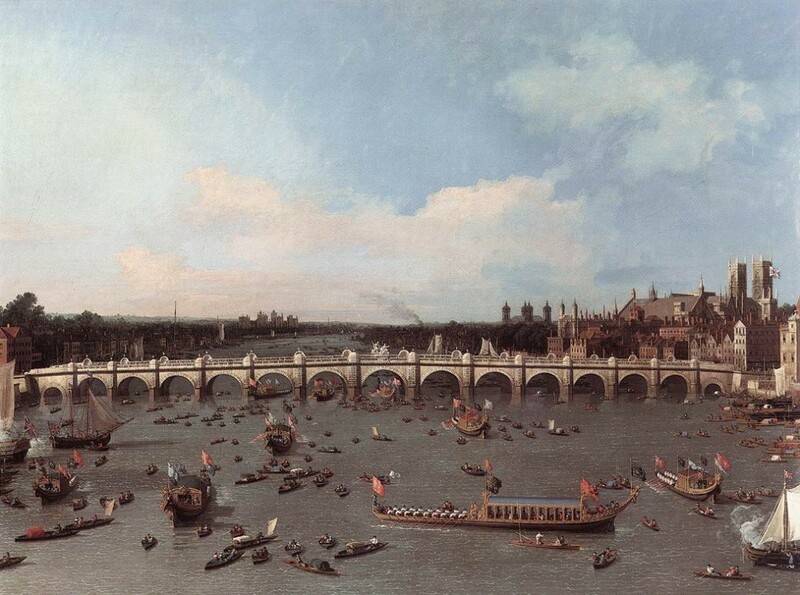 They were all different sizes, and had various forms of decor and frills, but are meant to head down the narrow rivers and canals all through England. I loved spotting them from the train window. 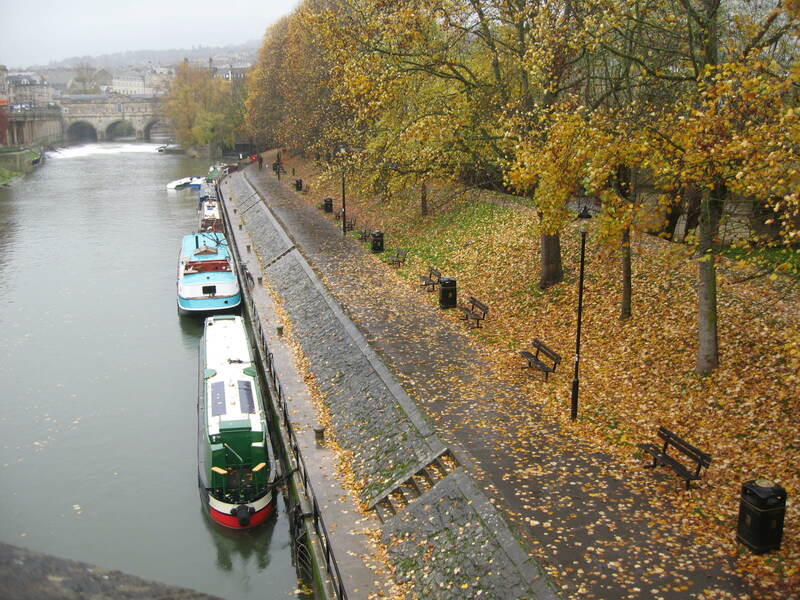 Finally, in Bath, I was able to get a closer look as they sat along the stone walls on the Avon River. Longboats resting in Bath. Photo by me. 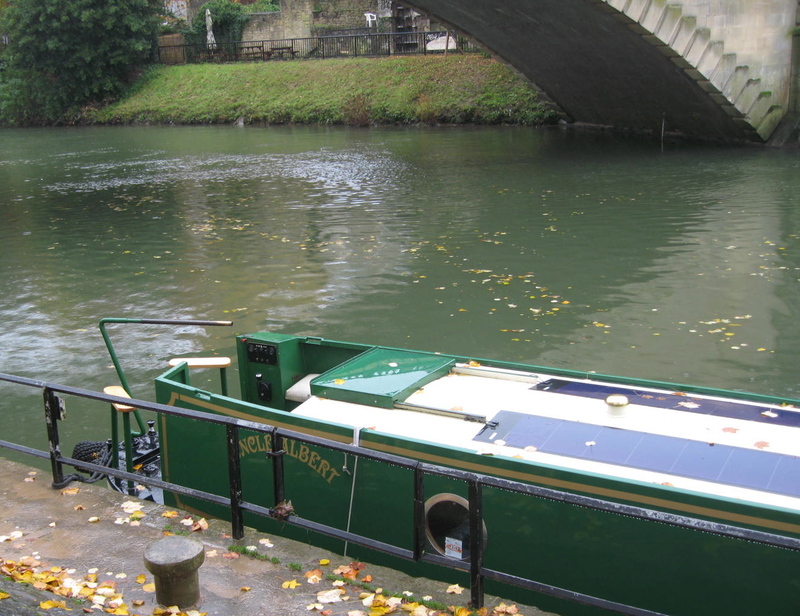 It was midweek in November, so very few were out working, but they were ready for a mild weekend when guests would take a leisurely trip down the river through the Limpley Stoke Valley and to Bathampton. One of my favorites was this funny green boat because of its name– the “Uncle Albert”. Anyone who has ever been a fan of the classic British sitcom Only Fools and Horses gets the reference. He was the beloved old character who had spent his life on the sea. 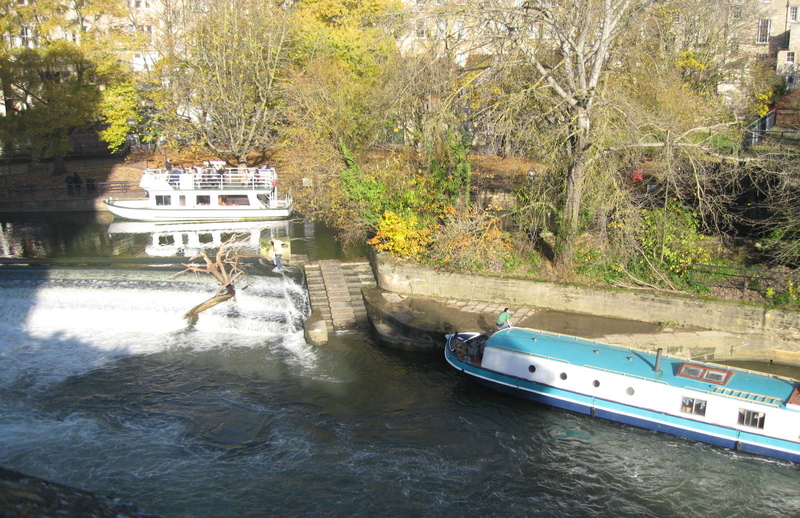 And if you have nothing better to do with your afternoon, you can always use your boat to remove nature’s debris from the river while the tourists watch. Life on the river. The British are never far removed from their boats and the sea. For such a very well-mannered country, the tides of England are pretty darn dramatic. Especially in Cornwall. It was so very evident wherever we went on the southwest coast. 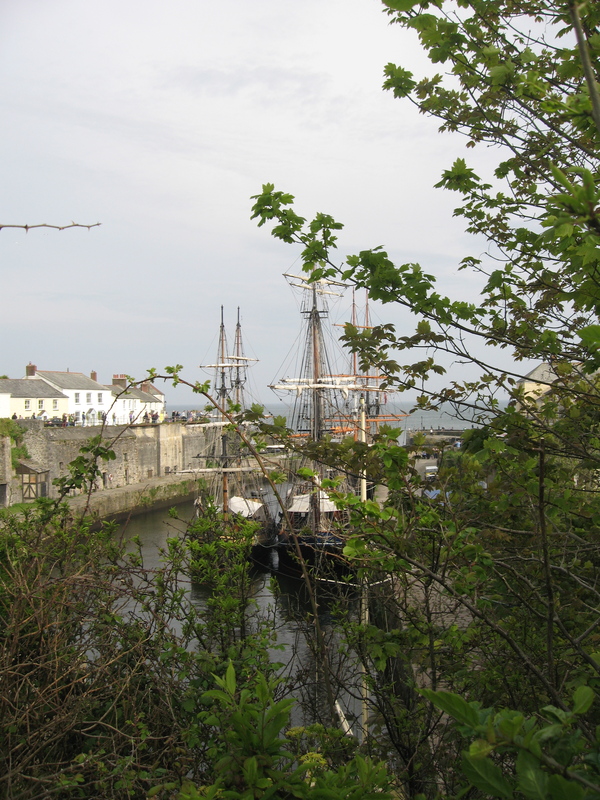 But nowhere were the large tides more obvious than in Charlestown, where the big, old ships are berthed. 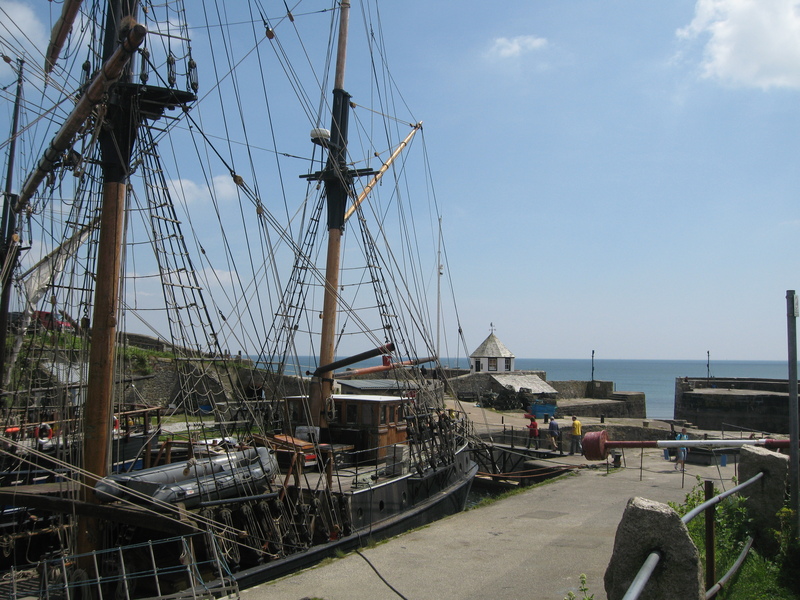 You might see a lovely bay, or small port, with the boats floating about, and when you came back a couple of hours later there is nothing but mud, and the poor boats are left high and dry. The change in sea level is very steady and goes from very high to very low in about six hours. 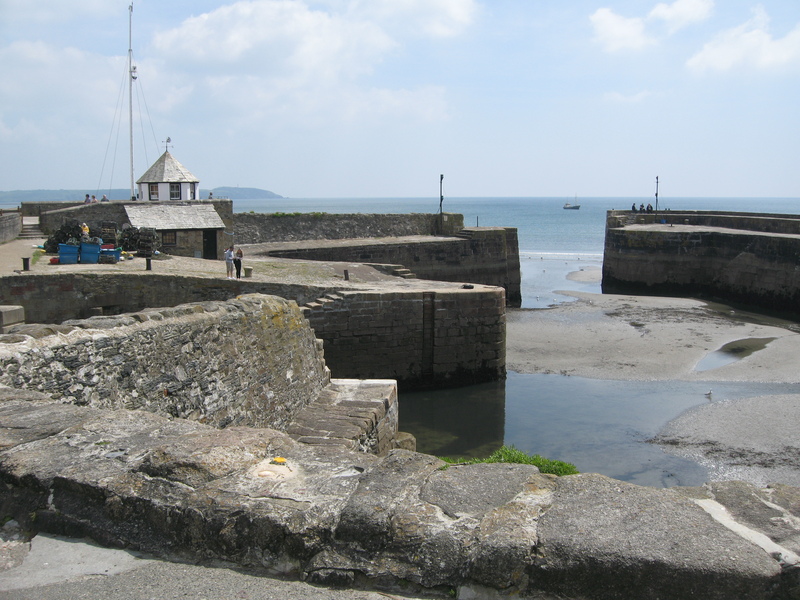 Luckily the Brits know all about the sea, and have devised clever hideaways to protect their ships from the outgoing tides — like the lock system here in Charlestown. 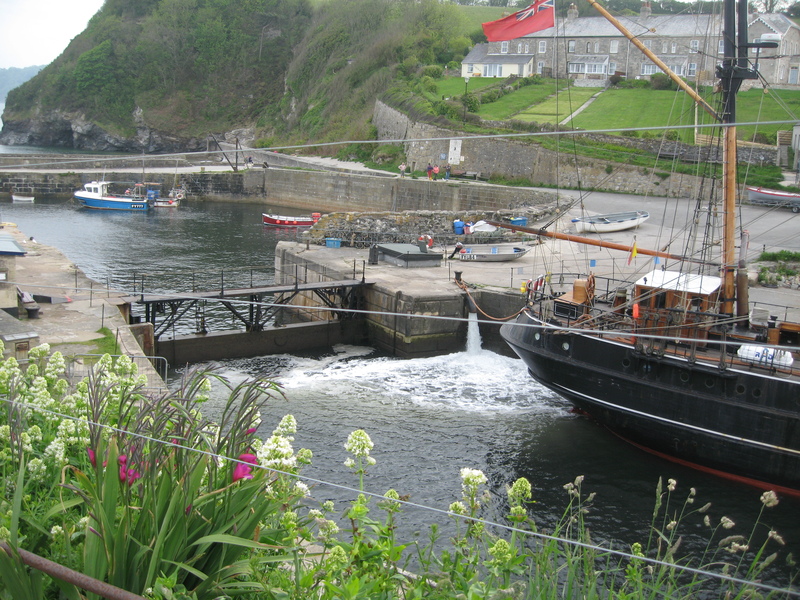 It’s a lovely feat of engineering that pumps the water in to the holding area if needed as the tide goes out. Someone actually closes the locks on the tides schedule. I imagine he keeps his alarm clock well maintained. 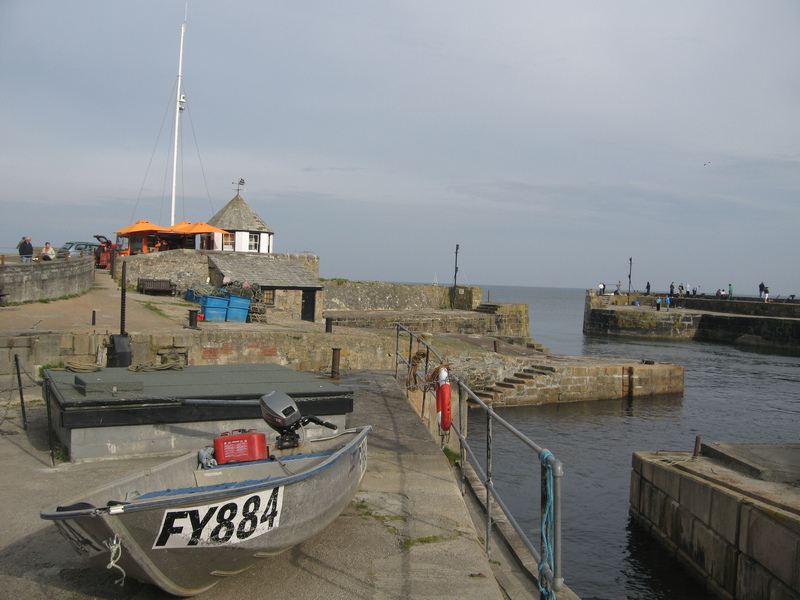 The system keeps the boats safe and protected no matter the time of day. 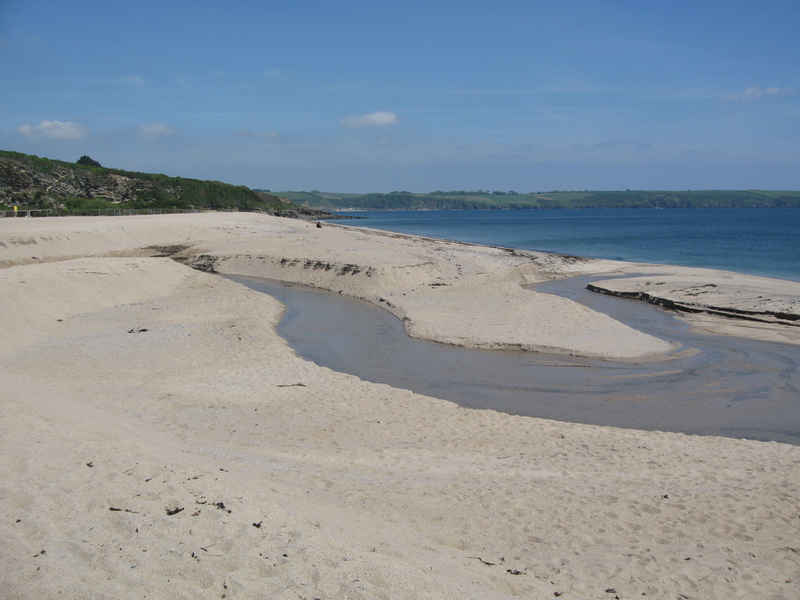 A beach in Cornwall near Carlyon Bay. Photo by me. 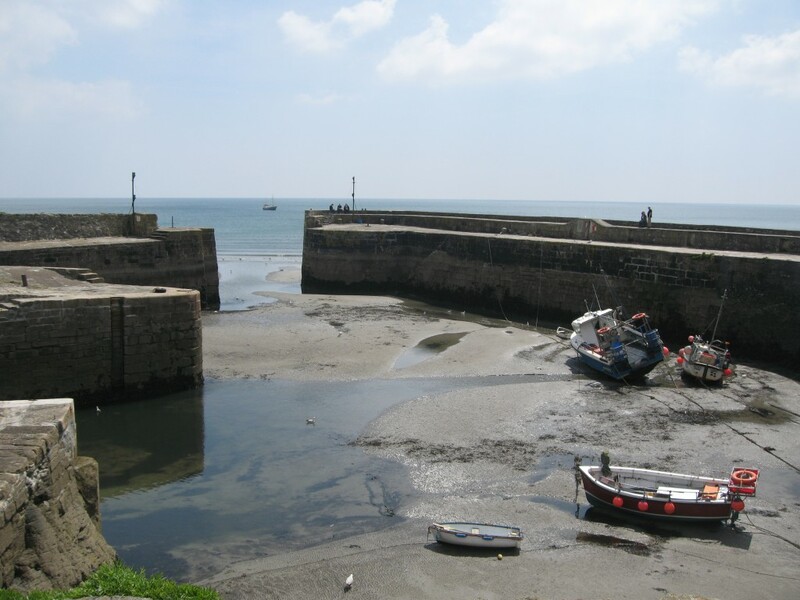 …the tide may just take a bit of England with it out to sea. In the paper the other day, I read that education minister Michael Gove was one of several individuals who had the brilliant idea to present Queen Elizabeth II with a new yacht for her Diamond Jubilee. 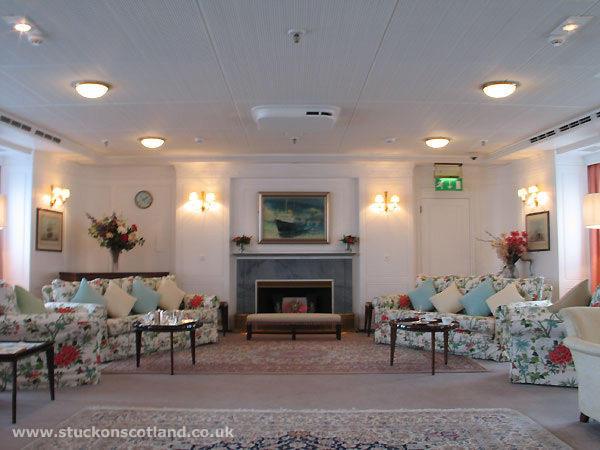 It would finally replace the Royal Yacht Britannia, which was decommissioned in 1997. Unfortunately, the prime minister, David Cameron, thought the hefty 60 to 80 million pound ($92 – $123 million) price tag might stretch the taxpayers generosity in these hard financial times, but welcomed supporting private efforts to raise the money for the project. 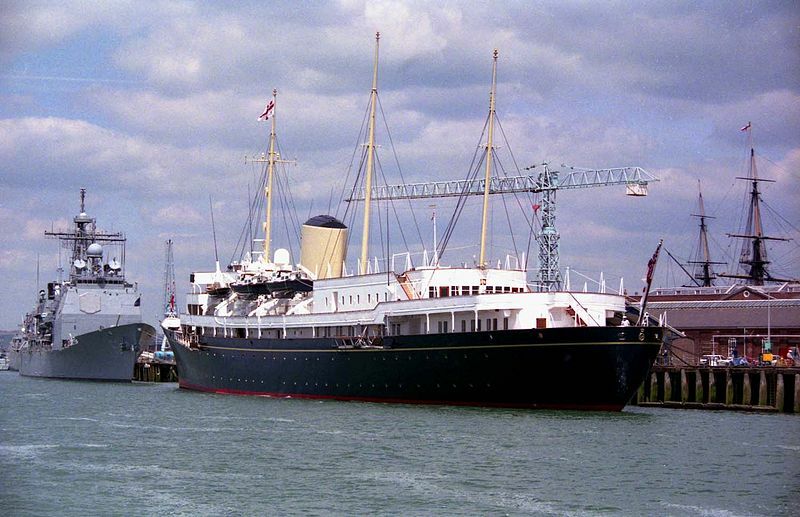 The Queen had a spectacular yacht before it was retired, The Britannia. It has a rich history, and occasionally was seen out around the seas of the UK and abroad after it was first launched in 1953 by HM Queen Elizabeth II. 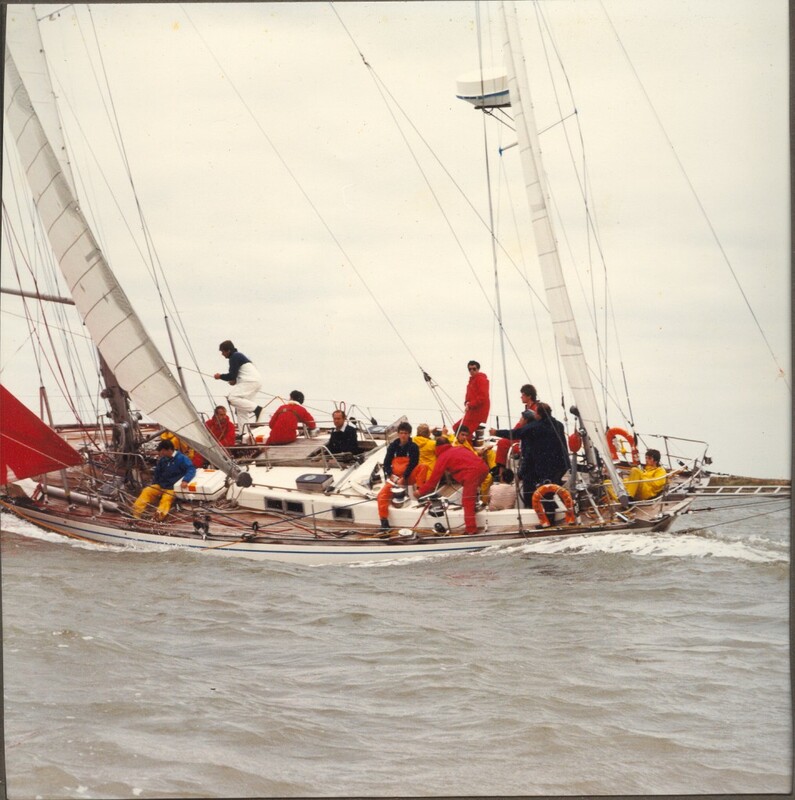 My Beloved Brit remembers seeing it occasionally when out yacht racing, especially in the summer at the Cowes Week Regatta on the southern shore of England. He always recalls it with great fondness. It is a beautiful yacht. The last time we were in Edinburgh, Scotland, we were able to board and tour the yacht, now a tourist attraction on the Leith dock right outside the city. It was incredible. It is absolutely one of the most beautiful yachts I have ever been on, and believe it or not, with all its attention to detail and exquisite furnishings, it seemed rather cozy. 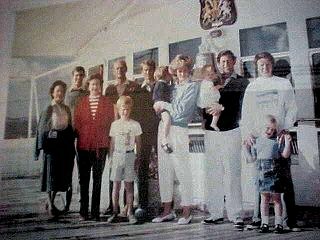 Still, I could imagine the honeymooners, Charles and Diana (see video), on her decks in 1981 after flying to Gibraltar to meet Britannia. Or Princess Margaret lighting a long cigarette as she entertained some lucky famous guests. You could just picture the Queen settling in to her private suite, or contemplating the future of her country while strolling its decks. 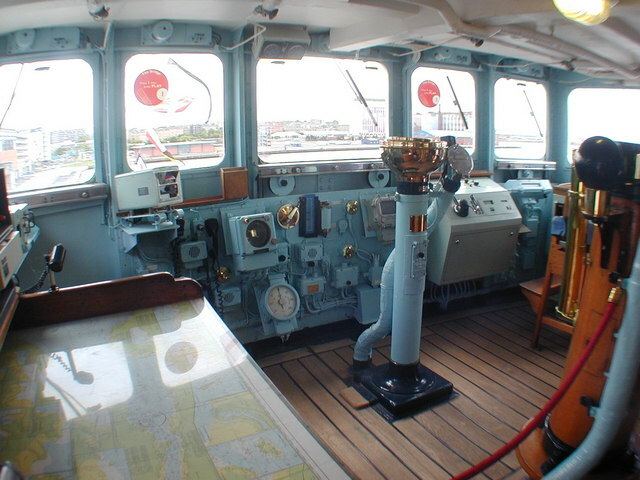 The controls of Britannia, photo by Alan Pennington, creative commons. He said that the queen’s “highly significant contribution” to Britain and the Commonwealth, which groups 54 nations, mostly former British colonies, should be recognised with something more permanent than street parties. Sounds like a very interesting discussion, indeed. I know MBB would welcome seeing a new Royal Yacht on the high seas. There is a major press event this evening (Monday 11/28) – a reception hosted by the Queen at Buckingham Palace for journalists expected to cover the Queen’s Diamond Jubilee next year. According to the UK Press Association release, “In honour of the guests the palace’s East Gallery will be renamed the Tweet Suite for the night – for those who want to post online messages – and the space will also contain displays about the Queen’s Golden and Silver Jubilees.” A Tweet Suite. You’ve got to love it! It’s a new age. The Duke of Edinburgh, Prince of Wales, Duchess of Cornwall and the Duke and Duchess of Cambridge are expected to attend and mingle with the press. 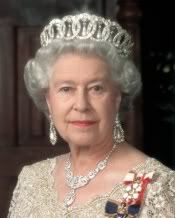 June 2012 is the celebration of Queen Elizabeth’s Diamond Jubilee in honor of her 60 year reign. There are many special events planned, but the one that I feel has the potential to be the most memorable will be the Diamond Jubilee River Pageant at high water on the afternoon of June 3rd. 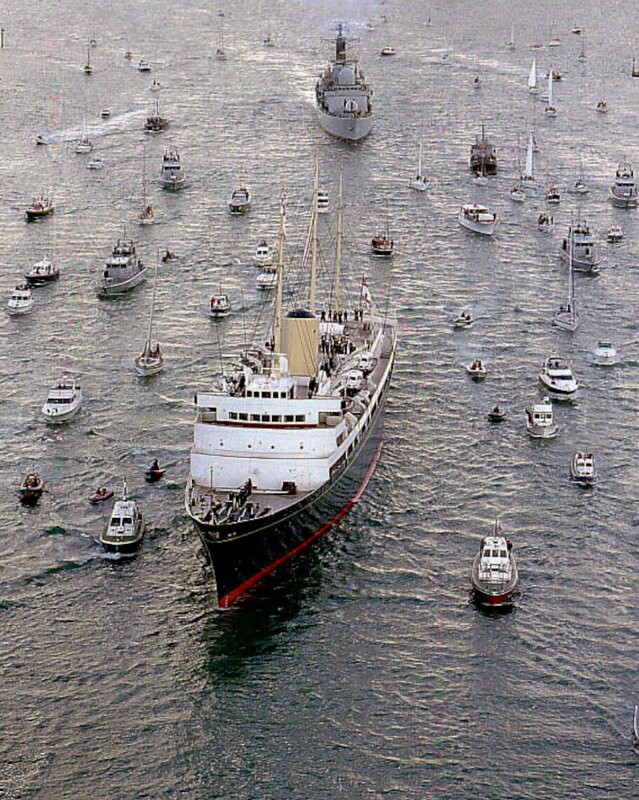 As the London mayor’s press release reveals, the Queen will lead a massive flotilla of up to one thousand boats beautifully dressed in streamers and union jacks. The boats will be assembled from across the UK, the Commonwealth and around the world. The event organizers are planning for well over one million people lining the banks of the Thames to join in the celebration and witness the grand parade of boats. The flotilla is expected to measure 7.5 miles from end to end and will be one of the major focal points of the celebration during the special Jubilee Bank Holiday weekend. 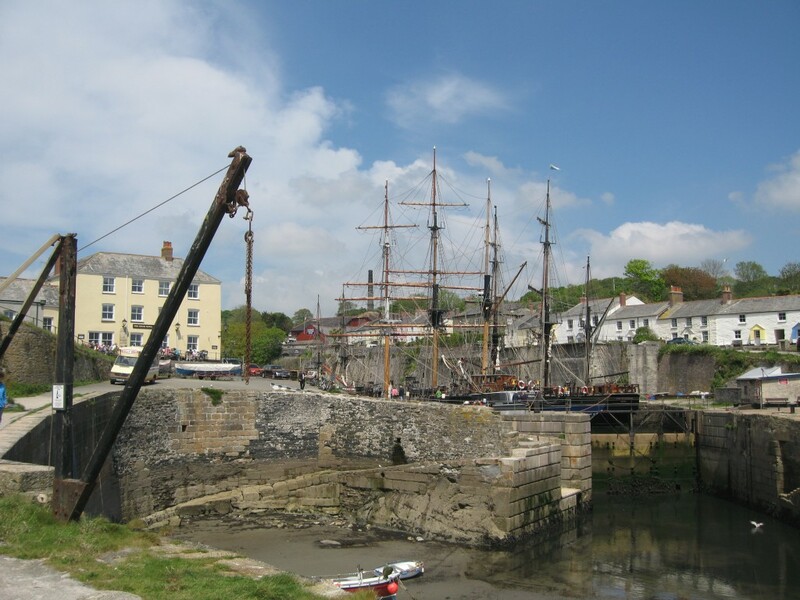 The plan is that there will be a diverse mix of historic and modern; from rowed boats to sailing ships, steamers to wooden launches and larger motorized craft.The flotilla specially aims to “capture the diversity of Britain and the Commonwealth’s proud maritime history”. 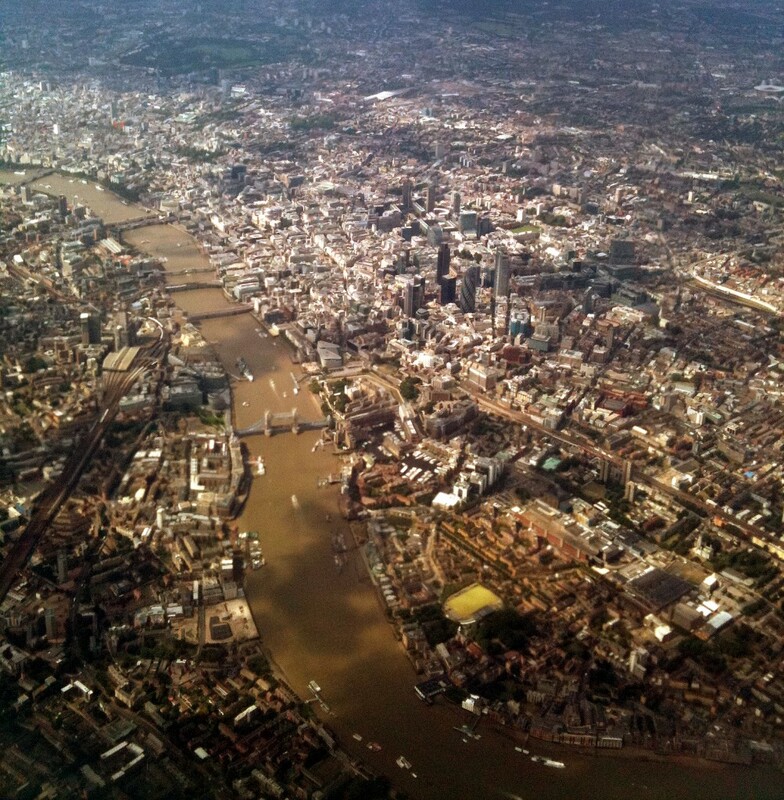 The Diamond Jubilee River Pageant will have music, and fireworks and special effects. The flotilla will be made up of 5 special sections, each separated by a “herald barge” the first of which will be a floating belfry of eight new bells. Their peals will be answered and echoed by chimes from riverbank churches along the route. There are even plans for special daytime fireworks and a mechanical flame spitting dragon. Yikes! What fun! It promises to be a spectacular event, and even though the deadline for boat entries passed on October 31st, it makes me want to find a boat and join in the excitement. Maybe we’ll have to settle for a spot on the shore. If you want information on this extraordinary, historical event, go to the Thames Diamond Jubilee pageant site for full details. My Beloved Brit’s cousin saved many of the photos of him growing up in England, and a few years ago put them all on a disc so we could enjoy them. I love looking through them, and did just that on one of the first cool evenings of fall. These two are especially telling. He’s always loved being on the open water, and nothing makes him happier than being out with his mates sailing. The boats may get bigger but the joy remains the same. My Beloved Brit as a young boy fell in love with anything that floated. That's him and his dad. He got older, but his love of boats just got stronger. This was a few years later on “Gandalf” in Burnham on the east coast of England. Bigger boat, lots of mates.